The Climate Garden System is comprised of high performance, super discreet all weather satellite speakers and a subwoofer, using Monitor Audio's proprietary driver technology. Its ground level installation amongst shrubs and trees delivers a luxurious blend of unobtrusive aesthetics and natural full range audio in gardens of any size. 70/100 V line arrays of up to twelve satellites per subwoofer makes the Climate Garden System expandable with additional satellite and subwoofer sets according to garden area. Operating temperature range: -4° to 158° F / -20° to 70° C.
High Quality From The Ground Up - The satellite speakers are a robust high sensitivity design built to deliver richly detailed hi-quality mid/high frequencies. Engineered to withstand the most extreme temperatures and weather conditions, their rigid conical cast-polymer enclosure houses the company's signature 1" (25 mm) C-CAM Gold Dome tweeter co-axially aligned with a 4" MMP (CLG140) or 6" MMP (CLG160) bass-mid driver. 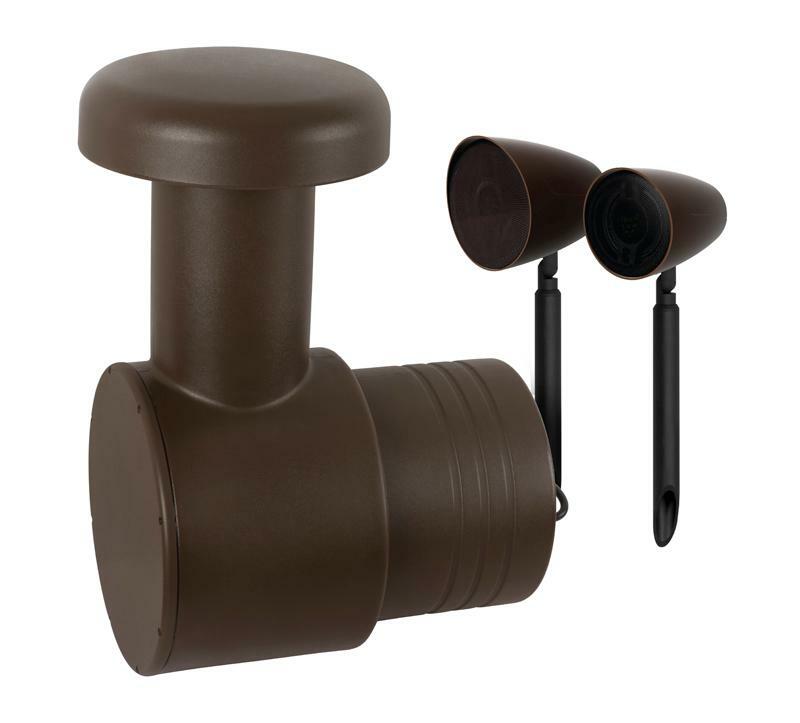 The horn-shaped housing provides excellent audio directivity in free air conditions when positioned close to the garden surface on a bracket/spike assembly, which neatly encapsulates and channels the connecting cable into the ground for a discreetly installed result. Subterranean Bass - Optimized for discreet sub-surface installation, the CLG-W12 subwoofer's proprietary Monitor Audio band-pass design incorporates an internally loaded 12" C-CAM driver which sits in a waterproof rotationally-molded polymer enclosure buried below the garden surface - only the CLG-W12's domed output port is visible. From this domed port powerful, tight bass frequencies will join the clean mids and highs of the surrounding satellite speakers for punchy and articulate full-range garden sound. Easy Daisy-Chain Installation - The CLG-W12 can be powered from a single amplifier channel at 4 ohms or with its 70/100 V line option recommended for cable runs over 10 m (30 ft.). System configurations are endless. CLG160 satellites on Left channel and CLG-W12 on Right channel. Six CLG140 satellites and one CLG-W12 on Left channel, and the other 6 CLG140 satellites and CLG-W12 on the Right channel. Up to 12 CLG satellites and one subwoofer can be used per channel. System expansion to larger garden spaces simply involves the addition of amplifier channels, subwoofers and satellites.